The ties that bind mother’s and their offspring are universally found throughout the animal kingdom. Sometimes, as humans, we think we corner the market on the extent of that bond and and the power that it invokes in how far we will go to protect and nurture our children. It is true that humans have a far more prolonged duration of care taking than other species. This, however, does not in any way diminish the pain experienced by mothers in other species, when their young are prematurely separated from them. There is an innate attachment between mother’s and their children that is so powerful that it can cause a mother to do things beyond her natural physical power to protect her young. We often hear tales of human mothers able to lift a car to save her child. Within the animal kingdom, less powerful creatures find the capability to save their offspring from more dominant animals. This power of love is truly one of the most amazing qualities found throughout nature. 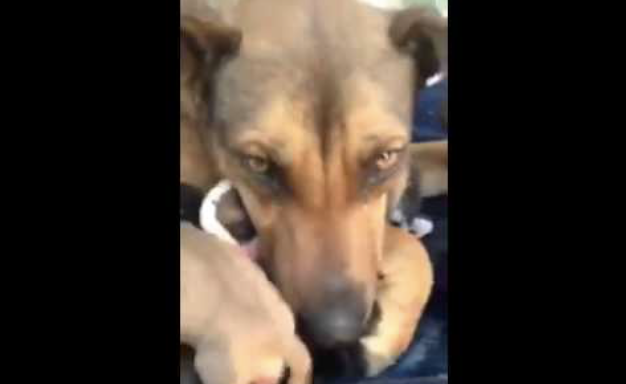 The following video which shows a mother dog shedding tears after being reunited with her lost pups. Some may see this as particularly human. The pain of loss and separation is not, however, unique to the human species. The relief shown by this mother dog is something that we can totally identify with as humans. The love and protection of our offspring is probably the most potent emotion found in nature. It would truly be wonderful if the universality of this kind of love could be spread beyond our offspring to make our world a place where love, rather than selfishness and hatred is so dominant. Enjoy the poignancy of this mother’s relief when reunited with the pups she loves with all her heart.